NEW BEDFORD, Mass. 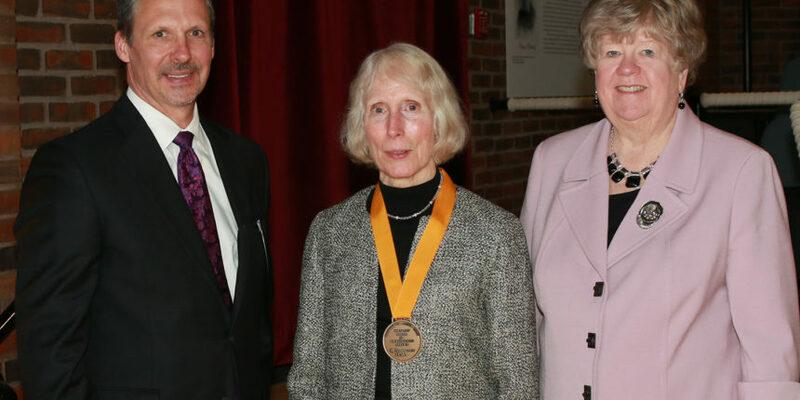 – Southcoast Health today announced that Elizabeth (Beth) Kunz was award the prestigious Southcoast Trustees’ Medal for Outstanding Service by the Board of Trustees for Southcoast Health at its Annual Meeting at the New Bedford Whaling Museum on December 8. The Southcoast Trustees’ Medal is presented to individuals who have shown exemplary service, selfless giving and commitment to the goals and mission of the health system and hospitals. It is considered the very highest honor the Southcoast Board can bestow – one that marks a lifetime of selfless giving and commitment to the health care of our communities.”Always modest about their service and philanthropy, Beth and her husband Randall nonetheless set the standard for generosity and commitment,” said Jean MacCormack, Chair of the Board of Trustees. Beth, a resident of Mattapoisett, began her service in 1995 when she joined the Tobey Hospital Board of Trustees at the urging of George Mock, a former board member who was then on the nominating committee. A partner in the firm Schaefer & Kunz in Mattapoisett, Beth served on the Southcoast Finance and Quality Committees following the merger in 1996 and was a member of the Southcoast Hospitals Group Board of Trustees since 1999, serving as chair in the years 2009 through 2010, and then of the combined System and Hospital boards in the years 2012 through 2013. In addition to her broad involvement in hospital functions, she, with her husband Randall Kunz, served as active participants on the Southcoast Centers for Cancer Care Planning Committee. They have also generously supported every Southcoast capital campaign pre- and post-merge and are 15-year continuous donors to the Southcoast Annual Fund.